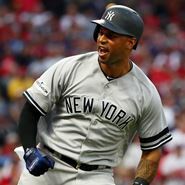 For Aaron Hicks, the month of July might have been his best as a Yankee yet as he slugged his way through the league while increasing his batting average 13 points over 22 games. Hicks began the month with a resounding bang against the archrival Boston Red Sox on July 1. On that night he went 3-for-four, with all his hits that night being home runs, including an opposite-field homer against Boston’s starter David Price. Furthermore, his four RBI led the way as the Yankees routed the Red Sox 11-1. The slugger added a pair of doubles and long balls over the next four games and while the power surge was the best part for the Bombers was that he remained consistent the whole month. The outfielder closed the month like he began, with spectacular performances, as he knocked seven hits over the final five games. On July 29 against the Kansas City Royals Hicks went three for three, with a home run, a double, a walk and two RBI. For the month Hicks’ numbers look nothing short of impressive as he finished with a .271 average, four doubles, six home runs (which led the team) and 13 RBI. He also led the teams in walks (20), on-base percentage (.429) and slugging percentage (.586). Although sometimes Hicks used to be the forgotten man in the Yankees lethal lineup, lately the centerfielder has been providing the Bronx Bombers with the kind of power and consistency that they will need in the stretch run if they still hope to not only secure a postseason berth but catch the A.L East-leading Red Sox.